J can't digest beef, although she can eat lamb, pork and even veal. Over the years I have tried to find substitutes but the closest I have come was duck breast, which has a steak-y quality and is otherwise a pretty versatile, readily available meat. Several years ago, J went to the Golden Door spa, where she had an ostrich burger, which she said was almost indistinguishable from a lean beef burger. I did some research and it turns out that ostrich, despite its rich, meaty flavor and color, is very low in fat and cholesterol, close to white meat chicken. I followed up by getting some ostrich steaks and ground ostrich through internet sources, and we enjoyed it. In the last couple of years, Roaming Acres Farm has been selling ostrich at various open-air markets in New York City, so it is no struggle to find it. The trick to cooking ostrich is to keep it rare. If you go to medium rare, it gets tough and tastes like well-done beef, pretty terrible. I have recently discovered the perfect way to assure that the ostrich is cooked to, but not beyond, the perfect temperature: the sous vide machine. I cook vacuum packed ostrich steaks in the sous vide bath at 127° fahrenheit for about four hours, then cool it in an ice bath and let it rest in the refrigerator. When you want to finish it, place it in a smoking hot skillet or under a hot broiler for one minute per side; it will char on the outside without exceeding 127°. 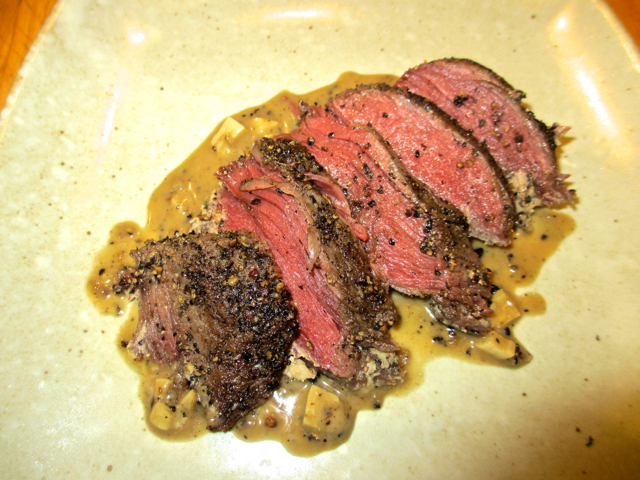 Last night I make ostrich steak au poivre, using a recipe for steak from Emeril Lagasse, of all people. Fa - bu - lous! Thumbs up for ostrich and also for sous vide cooking. My thinking has evolved slightly with experience. I now use 131 degrees. Share your experience, please.